Once upon a time this girl (points to self) never wore jewelry. Boys must have been in heaven- no expectations for awkward jewelry purchase for valentines day. I had a hard time even wearing a diamond ring-- I was once married and a bit more of a tom boy back then. Then one day I found my ‘style’ which happen to be the bolder/gaudier the better. Still sort of is. It usually involved moustache rings (before that was a fad) and owl necklaces (also before it was a fad). Originally I tossed them in a bowl and dug around every time I wanted to dress up my outfit. I found myself growing increasingly annoyed when reaching for tangled necklaces and quickly outgrew that method. Of course a traditional jewelry box wasn’t going to cut it… oh no. I simply HAD to make something that fit my lifestyle. AND, it’s completely customizable AND quite simple to make. 1| Figure out placement, it’s the perfect time to customize their locations to fit your needs. I knew I needed a place for lots of rings (the hooks), quite a few necklaces (the top knobs), a few bracelets (bottom knobs), and plenty of earrings (the chain). So I went with hooks on the side- for rings; knobs in the upper quarter for necklaces; knobs on the bottom for bracelets and the chain toward the top for earrings. 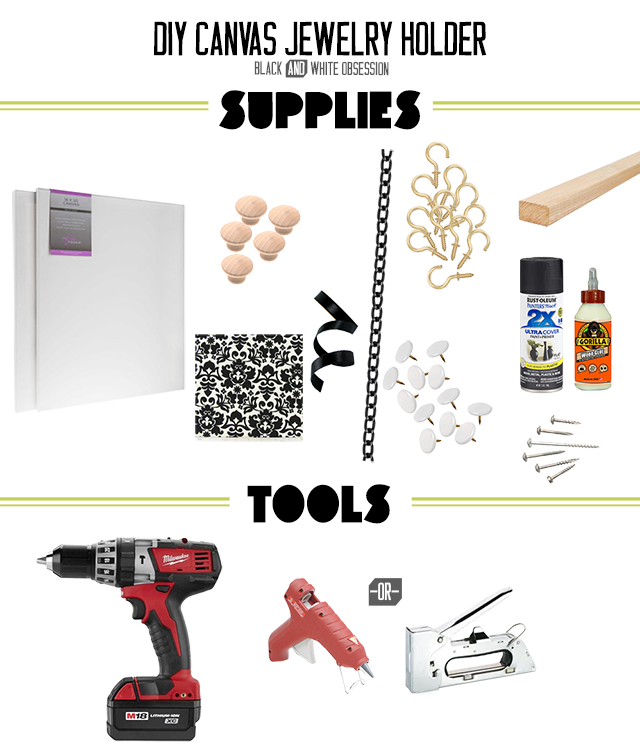 2 | Give the brassy hooks and the wooden knobs a quick couple coats of spray paint. I found that poking the hooks into cardboard was the easiest way to attain even coverage. You could also leave the hooks brassy. Which I should have done, but this project was done way before I fell hard for gold. 3 | While the hooks and knobs are drying, dry fit your fabric or begin designing the background of your canvas. 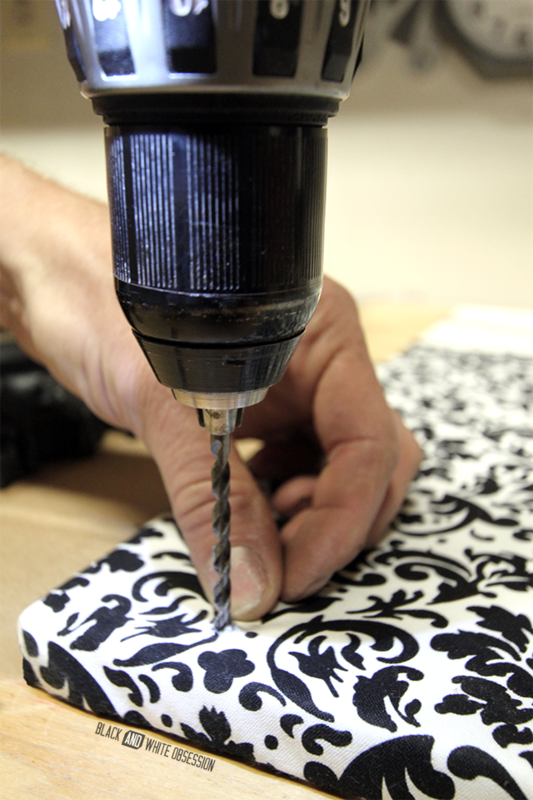 I covered the canvas 75% of the way with my favorite black and white damask pattern (at the time). Then used ribbon to give the edge a trimmed out look. Feel free to use any fabric that catches your eye, paint your own design, or even use your electronic cutter (like the silhouette cameo or circuit explore) for precise patterns. 4 | Support. My placement plan required knobs, for necklaces, toward the middle of the canvas. Since I used premade canvases the middle provided no support. I had the beau trim down some scrap wood to fit tightly between the frame of the canvas. To ensure they were supported properly we used wood glue and two long screws. 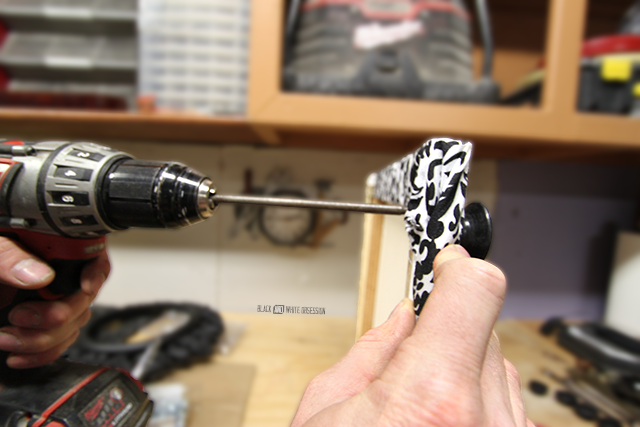 5 | Pre-drill the holes for your knobs directly into the canvas and wood. Learn from my mistake and drill BEFORE you attach the fabric. 7 | Hang using two drywall anchors and enjoy. I have since outgrown this particular setup and have considered making a second one for another wall. More than likely I’ll buy a larger canvas, and try some funky geometric designs. P.S. I was not paid or perked from any of these vendors; I just happily picked up the supplies necessary for the job. It's still super cute even if it's not quite your style anymore. I love the customizability of it. If my dad hadn't bought me a really nice jewelry case (it's a large picture frame that opens up to an organizer, it hangs on the wall... he's pretty cool :) ) I would try it out. Sharing!